Love the beauty of autumn leaves? 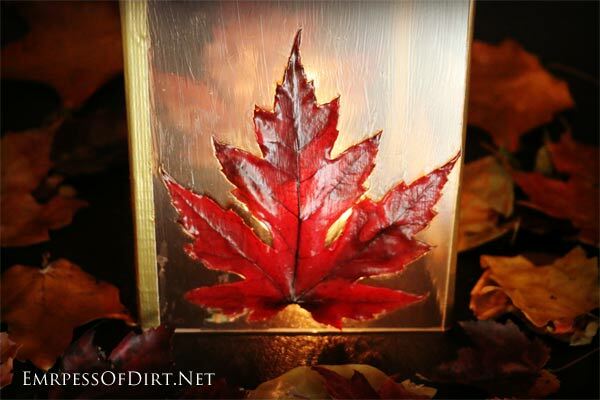 This frugal DIY leaf lantern is made from picture frame glass, leaves, and Mod Podge. While I love how it looks in the evening with a candle glowing inside (and it’s worth making just for that), I can’t say I’m thrilled with the day time look. I’ll explain more below. For more ideas like this, also see the Falling Leaves project. I’ve seen these lanterns made from leftover clear glass jars and vases, but I opted to use stuff I had in storage (as usual) to keep the cost to zero. I used the glass panes from 4 clip-it picture frames and joined them together with tape. The leaves were dried overnight between sheets of newspaper with books on top to keep them flat, which makes them easier to attach to the glass. 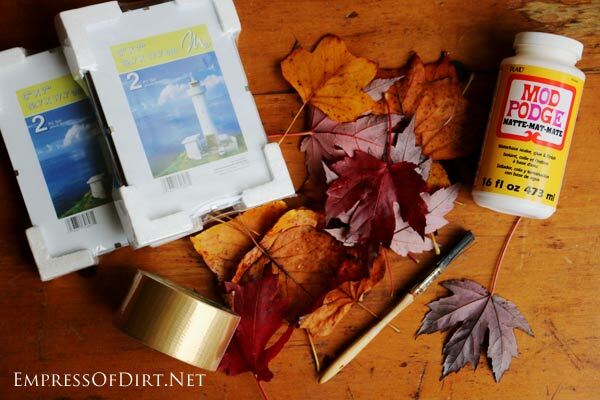 Related: How Fall Leaves Benefit Your Garden | Don’t Send Them Away! As I mentioned, this lantern looks really pretty with a lit candle in the evening, but I don’t really like how the glass looks in daylight. I opted to apply Mod Podge to the entire surface since I’m pretty sure it would look strange to just have it on and around the leaves. But the Mod Podge does give a glue-like appearance that isn’t great (to me). I was careful to brush the Mod Podge in the same direction back and forth and that helped, but no matter, it is how it is. You can decide if this is a problem. I’m probably being ridiculous. I am an Empress after all. And who looks at a lantern all day, really? Discover 12 lovely nature craft ideas here. Collect leaves. Dry them between sheets of newspaper overnight (not longer than 24 hours) and keep books on top to help flatten them. Clean glass panes (or jar or vase) and be sure surface is completely grease-free and dry. Attach leaves to glass. Apply thin coat of Mod Podge to back of leaf. Gently press onto glass. Top coat with more Mod Podge. 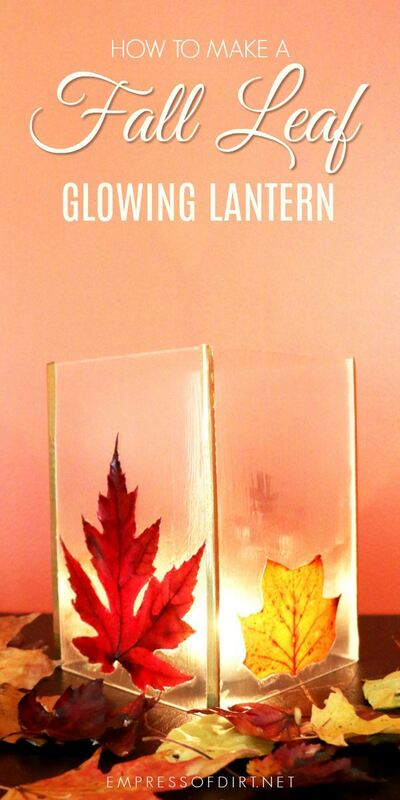 You may want to coat the entire glass surface with Mod Podge or just the leaf area. I did the whole thing. Allow to dry according to product instructions. Repeat Mod Podge building up several layers, allowing to dry thoroughly between coats. Tape glass panes together. I used narrow strips of metallic duct tape. Copper foil tape is ideal (it’s very pretty and adheres nicely). I placed the 4 panes side-by-side, joined them with strips of tape, and then joined the last two side to form a lantern. Add a votive candle or candle in a jar and enjoy! Never ever use candles unless you are in attendance the entire time. See more smart precautions here. Hi Ardith, It just looks a bit too glue-like to me but I think I’ll just leave it as is. Thanks!